The Super Bowl is this weekend and I have everyones favorite appetizers on hand, but not dessert. I love decorating cupcakes more than cakes because if you mess one up you just eat it and hide the evidence instead of crying because you have wrecked the entire cake. 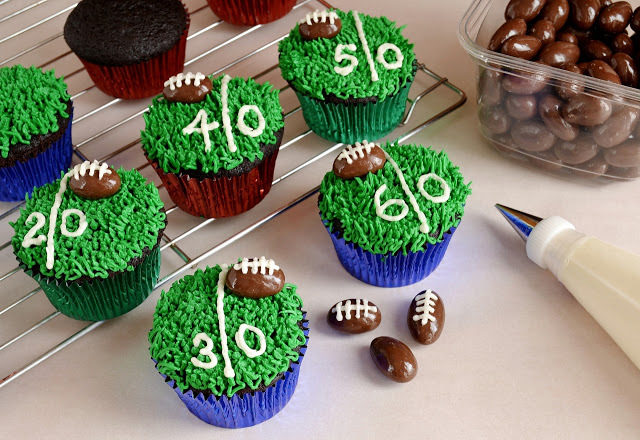 So these cute gridiron cupcakes are right up my alley. It doesn't hurt that the footballs are made out of my all time favorite candy! Chocolate covered almonds! You can check out the recipe for these Championship Chocolate cupcakes and a tutorial on how to decorate them over at Cakewalker. Love this idea! We aren't going to a Super Bowl Party but I will make these when football season starts up again! I love the almond footballs! So cute! Hi Lorie, thank you so much for sharing the cupcakes. Make it a great day and enjoy the game! Cute idea but there is one thing wrong with your cupcake decoration... there is no 60yd line. Got a chuckle out of the faux pas!